Clouds and some sun this morning with more clouds for this afternoon. High around 80F. Winds SSW at 10 to 20 mph..
Showers developing late tonight with the possibility of a thunderstorm. Storms may contain strong gusty winds. Low 63F. Winds S at 10 to 20 mph. Chance of rain 100%. Rainfall possibly over one inch. 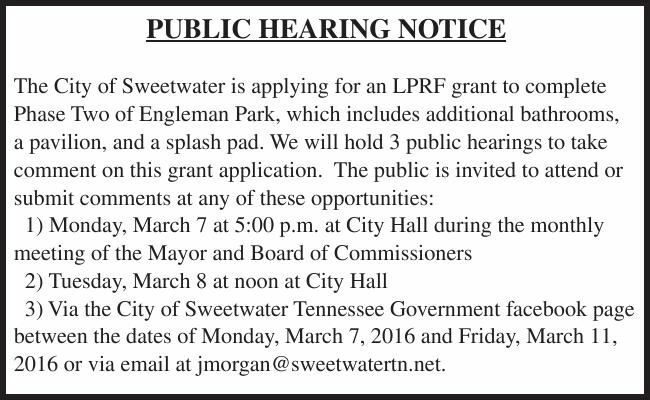 2016 or via email at jmorgan@sweetwatertn.net.